Mr. Walsh is responsible for analyzing investment opportunities and assisting in driving investment decisions for the Structured Credit & Special Situations Investments team. 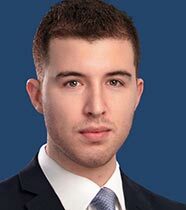 He joined DFG in September 2017 from Citigroup, where he worked in the Credit Correlation Trading and Structured Credit Strategy teams for about three years as well as interned as a Quantitative Trading & Analysis Summer Analyst. Mr. Walsh graduated from the University of Chicago with a B.S. in Mathematics.